A few days ago two young coyotes were playing and chasing each other exuberantly — that is how I’ve always seen these coyotes play. Soon, one ran down a hill and picked up a dead rat. It had to have been dead because the coyote just picked it up without a struggle — I only noticed it once it was in the coyote’s mouth. It was a large rat, bigger than the gophers I have seen them catch. The coyote looked at me and then carried the large rat about 50 feet before depositing it in an area of tamped down grass as I and the other coyote looked on. I could not see any details of the coyote’s behavior as it put down the rat because of the tall grass that separated me from him, but I do know that the rat was not rolled on and it was left entirely whole. Most of us would avoid a dead rat because of the diseases it carries. Coyotes are known to eat carrion — but it did not do so in this case. So, I’m wondering what purpose a dead rat might serve: was it a toy? Yes, coyote tails do wag, but from what I’ve seen, quite differently than a dogs. When the coyotes wag their tails in excited and anxious anticipation, the tails move very slowly in a back and forth motion. When they greet each other at a rendezvous, the tails seems to be swished around in circles — circles of ecstatic joy! Please note the pure joy displayed in their faces as these two coyotes play with each other. They are totally involved with the play and with each other. Their vision was intensely focused on each other as they played, though a couple of times they looked over at me. They seemed to concentrate on each others faces to anticipate what the other would do. Their play involved inciting the other to chase, chasing, keeping away from the other by running around a bush — sometimes the chaser “jumped” the barrier-bush, waging their tails in anticipation as they waited for the other to react, running together, feinting, testing. Notice their mouths are open, they are almost smiling. Also, there was crouching with the front part of the body down and back part up in a puppy “invitation to play” fashion. When they reached each other after a chase, their mouths were agape and often their teeth are bared, but they never made tooth contact. They often lay in a sphinx-like posture while waiting. They panted. The play continued for 24 minutes before they ducked into the brush. For half an hour I watched two young coyotes playing. When I first saw them, they appeared to be “wrestling”, but I was too far away for taking photos when I first sighted them. When I got close enough to take photos — never close enough for really clear photos, but at least you can tell what is going on — the coyotes stopped their activity, sat down and watched me. Soon they were playing again. There was lots of following one another and watching each other. There was lots of body contact and being next to one another and climbing over each other. There was a “toy” — I could not tell exactly what it was: either a dead vole or a glob of hair or a small piece of wood. This toy was tossed, from a mouth, high up in the air with a flick of the head, and then it was leaped for. Later, one coyote held the toy in its mouth while the other watched, totally absorbed visually with the activity. 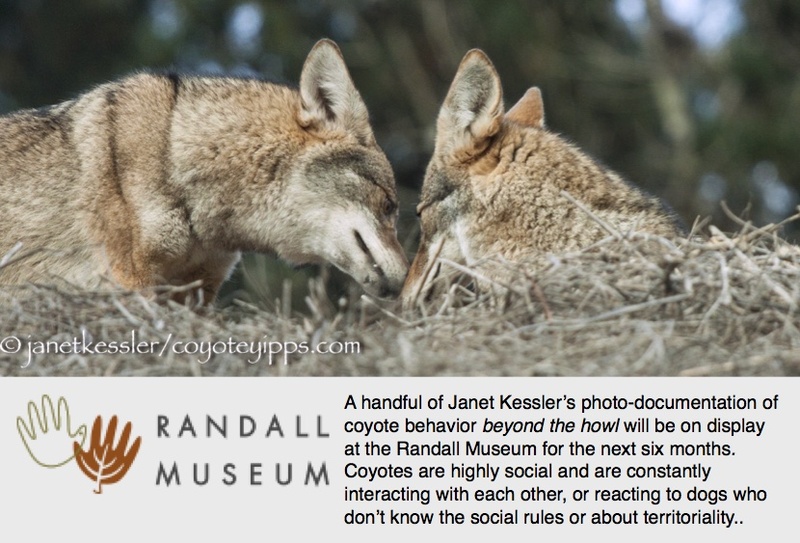 The coyotes looked at each other often, eye to eye. They touched snouts. One opened its snout right around the other’s, or reached to touch the other’s from below. There was running towards each other, and leaping through the low growth until one followed the other out of my sight for the day. I noticed that there was a hierarchy: it was always the same coyote that was sitting, or crouched, or below the other.